This IDF-TM-1624BK 16U Intermediate Distribution Rack from Middle Atlantic is a specially designed rack meant for housing equipment in overhead spaces in warehouses, retail outlets, and other similar open-area installations. The unit can be mounted overhead to a uni-strut beam or from trusses using threaded rods (not included). The unit features a number of options that allow for custom configuration to meet your exact needs. Multiple UHF/VHF knockouts are included on the bottom of the enclosure and the bottom plate can also be machined in the field to accommodate wireless antennae, dome cameras, and other similar devices. Side knockouts also facilitate conduit pass-through to an included standard electrical box. Dual exhaust fans in the unit help to cool your equipment and extend its useful life. The rack includes (2) pairs of 11-gauge steel rack rails with tapped 10-32 mounting holes in universal EIA/TIA spacing. The top panel includes (4) integral gland grommets to protect cables and prevent dust and other debris from entering the cabinet. A power distribution unit is also included with the rack. This unique rack is designed for housing equipment in overhead spaces in warehouses, retail outlets, and other similar open-area installations. 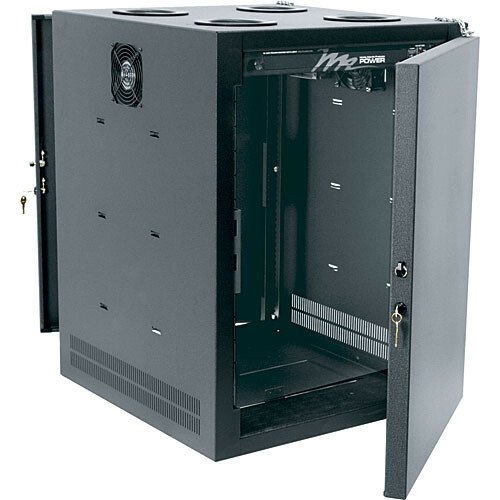 This enclosure features a number of preconfigured knockouts that allow you to custom configure your setup to meet your exact needs. Two fans are included with this unit to keep your equipment cool and extend its useful life. This enclosure's welded-steel construction guarantees exceptional strength and years of use. All rack rails are finished in a durable "e-coat" to prevent clogged threads. Rack rails are labeled in EIA standard rack-space increments, allowing for easy equipment alignment. Grounding/Bonding Studs have been provided to help you electrically ground and bond equipment per NEBS and NEC standards. Dimensions (HxWxD) 31.13 x 23.52 x 24"
Box Dimensions (LxWxH) 37.0 x 30.0 x 27.0"